Homer is the name that has received credited for being the author of the very ancient Greek epic poems the Iliad and the Odyssey. He is considered to be the greatest poet ever from ancient Greece. The ancient tales have had a tremendous impact on Western civilization literature. Over the years, the authorship of these epic poems has been widely disputed. Herodotus (an ancient Greek historian) estimated that Homer was alive 400 years before his time, and that places the time around 850 BC. Other ancient sources state that he lived during the Trojan War era, in the early part of the 12th century BC. Some Homeric scholars suspect that there might have been multiple people who helped to create the two epic tales. Whether Homer was just one individual or many, most scholars believe that Homer lived during the 7th century BC or the 8th century BC. Very little is known about Homer. Many literature scholars and historians have spent a substantial amount of time researching Homer, but there is not much concrete proof that this person ever existed. The only real details that the world knows about Homer were handed down in tales. These stories say that Homer was a blind person, but most disagree about his birthplace. Many historians believe that Homer was born on Chio Island while others claim that Homer was born on some Ionian city. Despite the fact that very little is known about Homer’s identity, his work is well known. 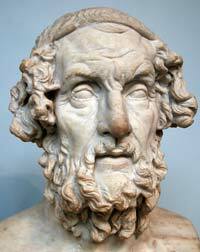 Homer’s epic works come from what has been widely regarded as several generations of oral story telling. It is impossible to actually know just how many other stories actually existed back then. The formative influence of these ancient epics in forming Greek culture is widely recognized. Homer has been often referred to as the teacher of ancient Greece. Homer’s works were mostly speeches that were models for persuasive speaking, as well as writing. They were copied all over the ancient world and medieval world. Papyrus fragments of Homer’s work make up almost half of all finds that are attributed to be authentic Greek literary works. Most scholars agree these two epic poems were created for oral presentation. The Iliad is an ancient Greek epic written in dactylic hexameter. The epic tale takes place during the famous Trojan War. This was a ten-year struggle by the Greeks against a city called Troy (Ilium). The tale describes the important events and battles that occurred during the fight between the warrior Achilles and King Agamemnon. In part, this is a sequel to The Iliad and is thought to be the second oldest Western literature work. This epic poem is mostly centered on Odysseus, a Greek hero (called Ulysses in the Roman era) and his journey back home to Ithaca following the fall of Troy. Odysseus takes nearly ten years to reach Ithaca after the Trojan War. It is presumed that he is dead, and Penelope (Homer’s wife) and his son, Telemachus, have to cope with several unruly suitors who fight over Penelope.